Mac OS X lets you keep folders in the Dock. This makes accessing frequently used folders quick and easy. The problem is that without customized folder icons, you cannot tell the folders apart. In many cases, having a short text label over an icon makes it much easier to tell what's in the folder. However, creating such an icon using a graphic app and an icon app can be difficult and time-consuming. Just pick a base icon and type in a short text label. Two sliders let you rotate and skew the text to match the orientation and perspective of the base icon. And to position the text, simply click and drag. When you are satisfied with how your new icon look, simply click the Apply button and you're done! 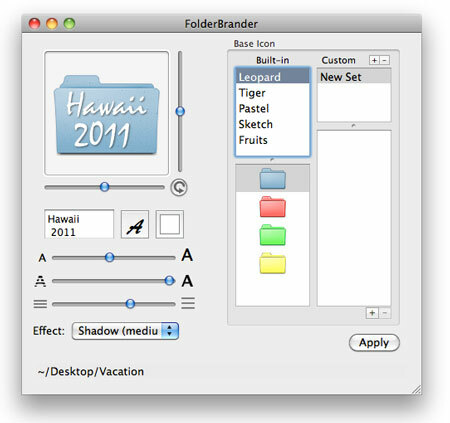 For a limited time, FolderBrander is available on the Mac App Store for just $6.99.